The Benefits of Professional Hard Floor Cleaning - AZ Precision Ltd. I know it is not about the buzz of the #Oscars everyone is talking about. Nevertheless, it is a subject some of you would find useful. You may ask yourself the following questions. Why do you need to clean your floor regularly? Why do you need a professional floor cleaning? After all it is not a rocket science to just sweep and wipe it with a clean cloth. I hope the following will give an answer to most of your questions. To keep your house or business premises looking clean and professional, it is important to have the floors maintained properly and that includes stripping and waxing/polishing every so often. The process not only removes grime and bacteria, but also improves the appearance of the floor and renders it slip resistant. Most flooring that needs to be stripped will be obvious. It will be either yellow, dull or uncleanable. Stripping is done by following a series of steps. We, at AZ Precision, do it using professional equipment, the most suitable chemicals, and know-how to help bring back the shine of your tiled/stone/vinyl floor. We work weekends or evenings so not to interrupt your already busy schedule. Stripping and polishing is a term that refers to removing the existing polish on your floor and applying new floor finish. 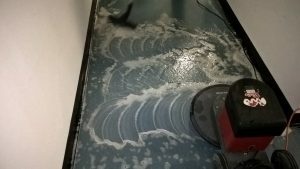 Stripping is a labour-intensive process where low speed buffers (floor machines that run up to 175 rpm) are brought in and remove the wax/ polish. First, floor stripper is applied to the worked area and it must be allowed to sit for ten to fifteen minutes. Then, the low speed buffer is run over the floor with an abrasive pad to remove the old wax/ polish. The result is a combination of old wax/polish and stripper that is then vacuumed or mopped up. This process is repeated until all of the wax is removed. Once the floor is stripped, the floor should be rinsed once more to remove any residue, loose particles and ensure a clean floor to apply seal. 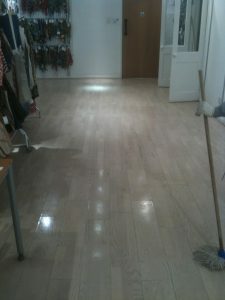 The floor must then be allowed to dry completely before any wax/ polish can be applied. Wax/ polish is applied in coats where the number of coats is determine depending on the specifications and desired shine of the floor. If a high, lustrous shine is desired, it will typically require six to eight coats. Four coats of wax will deliver a medium shine. After the above steps are completed, your floor is now ready for use. Buffing refers to the process of using a high-speed buffer on the floor to make the wax or polish harder. High speed buffers run between 1200 rpms and 3000 rpms depending on the manufactured make & model. Mopping should be done with cold water and PH neutral detergent. If hot water is used on a waxed floor, it can cause a cloudy appearance. Do not use harsh cleaners to mop the floor as bleach or ammonia based products will strip wax off the floor and most likely damage it.